It's been years since I've dined at La Dolce Vita in Cleveland's Little Italy neighborhood. I believe three, to be exact. I had a work meeting there, and to be honest, wasn't too terribly impressed with my salad and pasta during that meal. I think that I left there saying "Eh, it was alright, but not worth going back to in a hurry." I thought that I must have been missing something, because Clevelanders had spoken highly of the Murray Hill establishment. Well, I finally made it back in to La Dolce Vita. The restaurant's public relations team contacted me a few weeks ago, to see if I'd be interested in coming in for a tasting menu. I was curious. It had been years at this point, and I've continued to hear praises for the restaurant since my first visit. It was time for a second try. First of all, I absolutely love the use of fresh tomatoes as decor around the restaurant. They greet you from every corner, and adorn many tables. Chef/Owner Terry Tarantino is clearly a fan, as he should be. These locally-sourced tomatoes that he gets from a "secret" farm down Akron-way are some of the best Ohio tomatoes that I've tasted since moving here. We had a chance to try them as Terry greeted diners with a small plate of complimentary freshly-tossed tomato salad. By "freshly tossed" I mean that he was literally walking around the dining room with the big metal bowl, blending together the ingredients and plating them. The phrase "Keep it simple, stupid." ran through my head as he was describing what makes his version so outstanding. Use only 1/4 vinegar, and 3/4 oil. Most restaurants/home cooks do the opposite. Also, keep that balsamic far, far away, in his opinion. I've tried twice, at home, this week, to recreate his tomato salad. Unsuccessfully, I might add. While this simple plate of tomatoes (with feta, olives, and red onion) remained a highlight of the meal for us, we were not disappointed by the many dishes that followed. We had his famous Pesto Omar. A flavorful dish with chicken wrapped in prosciutto, that made even this chicken-hater dig in. One of our other favorites of the meal was the pasta with Gorgonzola sauce that was served as a side to the chicken. Wowza. As if we weren't stuffed enough, a small plate of fresh blackberries and ricotta appeared at the end of our meal. A combination that I would never think to do, and something that Terry loves to serve to friends and family. I can see why. Again, so simple and pure. The food at La Dolce Vita is not complicated or flashy, much like the owner himself. He speaks with pure passion for quality ingredients when discussing his cooking style. Quality ingredients do the talking for themselves. Terry prides himself on shopping at the farms and markets himself, and building trusted relationships with his vendors. I left the meal full, comforted, and with a much more lasting impression than my first visit. At La Dolce Vita, the food is meant to do that, in a relaxed neighborhood-vibe. As if you're family. Watching Terry work the room, sitting down at many tables, shaking hands, making menu suggestions, and pulling out bar and kitchen favorites to share, it was exactly what an Italian restaurant should feel like. Now, everything that we had is not currently on the menu, or in the same form. Terry shared with us his plans to change about 2/3 of the menu, after some inspiration his hit from looking back on his time spent in Italy. If you've never been, or it's been a while, I encourage you to visit the corner restaurant right in the heart of Little Italy. Disclosure: I was invited, with a guest, to attend a private tasting dinner at La Dolce Vita. All food and wine was complimentary. All opinions stated are 100% my own. Our biking adventures in Old Brooklyn continue, and this time, it brought us out for a diner breakfast at Steve's Family Restaurant. Not to be confused with Steve's Diner, which I blogged about not that long ago. First of all, I was shocked at how big it was inside. It actually spans multiple store fronts on Broadview Road. It was very clean, pleasant, and step up in atmosphere from your average diner. They had a pretty lengthy menu of breakfast and lunch foods. They are open from 7:00am - 4:00pm Monday - Saturday, and 7:00am - 3:00pm on Sundays. We were there on a Sunday. It wasn't packed, and there was no wait for a table or booth, but there was a steady flow of people. Definitely a regulars' hangout. I never stray too far from my favorite classic breakfast when I'm at a diner. Just give me two eggs over-medium, wheat toast, and bacon. I'll take or leave the potatoes. Steve's platter happened to come with bacon AND sausage. Overall, it was an acceptable diner breakfast. Nothing special, but everything was solid with the exception of under-cooked potatoes. I need to learn to ask for them "well-done" like my parents do at every diner. A cheap (Dining Deals Alert!) and satisfying breakfast on the go, but Gus's still remains my favorite diner close to us. This weekend seemed to just fly by, more so than usual. Friday night, "R" and I went and purchased wedding bands! Very exciting. Then, we headed over to Cork & Cleaver Social Kitchen for a fabulous meal, once again. They just do not disappoint. Saturday came, and the morning was spent doing errands and cleaning the house. All of a sudden, it was the afternoon, and it was time to head to Whiskey Island's Brew-B-Q, hosted by Great Lakes Brewing Company, to benefit The Hunger Network of Greater Cleveland. I think Cleveland was graced with one last summer day on Saturday, and the weather was perfect for this outdoor event in the park. The sun was shining, boats were bobbing on the lake, dogs were frolicking in the water, and there was some delicious BBQ food and brews to be had. ...my obsession with meat on a stick was indulged by Bacon on a Stick from The Proper Pig. However, my favorite thing that we ate on Saturday came from Sauced Wood Fired Pizza. They were serving up some delicious wood-fired pizzas, including a BBQ Pork with pulled pork, pineapple, bacon, and BBQ sauce. I want more. They weren't allowed to compete in the official BBQ challenge, but they would have gotten my voting ticket, if I could have. What a great day at the lake, and I hope that this becomes an annual event for The Hunger Network. Disclosure: I was provided with two media passes to attend the event, and two tickets to give away, in exchange for a giveaway blog post. I was not asked to share my experience after the event, but chose to do so. All opinions stated are 100% my own. This post is going to take you on a tour of the menu at Giovanni's Ristorante. That was Chef Zach Ladner's intention when he reached out to me several weeks ago. He wanted to bring me in to experience a little bit of everything that Giovanni's has to offer. When we arrived, I knew to look for minimal signage on the corporate building off of Chagrin Boulevard in Beachwood. The sign could be easy to miss. You can get into the restaurant two ways...a more direct route through an entrance on the right-hand side of the building, or from the front of the building (as we did). Once we entered the actual restaurant, I admired the gorgeous wine cellar wall, made with glass and separating the main dining room from a smaller private room. The bar area looked sleek and modern, and overall it wasn't quite what I had expected. In a good way. It certainly feels high-end in the main dining room, but without feeling stuffy or outdated, despite the restaurant's long history. Renovations several years back made sure of this. I had no clue what "R" and I were getting ourselves into when Zach invited us in for a tasting of the menu. We hadn't discussed it much, and I had left it in Zach's hands. We were shocked when presented with a very lengthy tasting menu upon our arrival. 10 courses! Oh my, how would we ever try it all? Thanks to expert pacing, and smaller portion sizes, we managed. It was just so darn good that we couldn't stop. We almost licked our plates clean on a few courses. It ended up being one of the most memorable meals of my life. The meal started off on a high note with the Chilled Cuttlefish Salad with squid ink romesco, almond, lemon, and parsley. Light, herbaceous, with a hint of citrus, it was a great start. Our second course was equally as delicious and impressive; an Ohio Raised Beef Tartar with bone marrow, radish, crispy egg yolk, pesto, mustard seed, and garlic toast. The bone marrow was topped with this wonderful tartar, and a highly skilled fried egg yolk concoction. I broke through the crispy shell and released this gooey, fantastic yolk. It was served with garlic Parmesan toasts, that made a perfect vehicle for the tartar and buttery marrow. Our third course brought House-made Ricotta Gnudi with shaved black winter truffle, parmigiano, and brown butter. These dense gnudi were so decadent and rich with flavor. I wouldn't want more than 4-6 of them, so this was a perfect portion size. Fourth course was a Horseradish Crusted Alaskan Halibut with peas, fava beans, lollipop kale, and a sweet corn veloute. The horseradish was mild enough to not dominate the fish, and it was perfectly cooked. I could have had just a bowl of that corn veloute, but I'm a sucker for anything with Ohio sweet corn this time of year. Our fifth course arrived, bringing us the Chef's favorite...Porchetta of Gaspor Farms Milk-fed Porcelet with polenta, sausage, fennel, grapes, mustard, and natural jus. It was very flavorful, and the pork was moist and tender, but the thin crispy skin was a tad too crispy for our personal taste. It was the only course that I didn't care to finish completely, and probably the only one that I wouldn't order on my own. Next up was a Milk-fed Amish Veal Cheek "Pot Au Feu" with potato, mushroom, carrot, tomato, brussels, and gremolata. All of the food that evening was beautifully presented, but some of my favorites were the rustic wooden board of the tartar and the small clay pot with this course. As we opened the top, a rush of wonderful smells hit our noses. "R" wasn't in love with the texture of the veal cheek, but I didn't mind it. It does crumble in your mouth, but it was so tender that a fork barely needed to touch it. Our last savory course of the evening was an Elysian Fields Lamb Loin with onion ash, potato charcoal, romanesco, endive, and lamb shank jus. The chef's creativity and skill set really stood out with this dish. The "onion ash" was something that we've never seen before, and we were peppering him with questions when he stopped by later in the meal. Then, we headed into the last three courses...all dessert. Mr. Sweet Tooth, "R", was in heaven. The cool thing about Giovanni's pastry chef? She's not only talented and creative, but she's the wife of Executive Chef Zach. Chef Alyssa wowed us right away with her "Milk and Cereal" dessert, a play on classic Fruit Loops, featuring kaffir lime anglaise and crispy meringue. The crispy meringue were a variety of brightly colored loops, and you literally felt like you were eating an adult version of the classic kids' cereal. Unfortunately, the lighting was poor and it didn't photograph well. The second dessert, and ninth course, was a Blueberry Polenta Cake with lemon curd, blueberry, and sweet corn ice cream. The sweet corn ice cream paired so well with it. All good meals end with chocolate, right? Our final course of the evening did just that. We had Mint and Chocolate, with 72% araguani cremeux, fresh mint gelato, devils food cherry, crispy mousse, and maldon sea salt. Completely stuffed at this point, we felt like we had had it all. I left the meal feeling like we truly got to see exactly what the chefs have up their sleeves, and had experienced such a well-rounded meal. Highlights for me were the Cuttlefish Salad, Beef Tartar, Halibut, and Lamb Loin. This tasting menu was representative of current items, favorite specials, and just some plain fun in the kitchen. Service was also impeccable, and certainly lived up to the reputation that Giovanni's has been known for. Our server in particular, Reem, was knowledgeable, passionate, attentive without being intrusive, and she let her sense of humor peek through at times. Exactly how fine-dining service should be. But it wasn't just Reem, and it wasn't because we were there for a special Chef's Tasting. I carefully observed the entire staff as they attended to the dining room and interacted with the diners and each other. You can't find this level of service just anywhere. Many of our dishes were finished at the table. As sauces were poured, covers removed, truffles shaved, cheese grated...you were involved in the process, and watching the dish come to life in front of you. The restaurant has done away with their suit jacket requirement, but you'll still receive one of the best fine-dining and high-quality service experiences here. All in the comfort of a warm and inviting dining room, and an abundance of fantastic menu options. This isn't your average Italian restaurant, and we left with such a lasting impression of the food and staff. We are already plotting a return visit. It was that good. Have you been to Giovanni's before? Whether you had or not, what was your impression of the restaurant? I hope that this post encourages you to check out this gem of a restaurant. Disclosure: I was invited to the restaurant for a private Chef's Tasting. All food was complimentary, and we paid for alcohol and tip. I was not asked to blog about the meal, but chose to share this experience with you. All opinions stated are 100% my own. I'm feeling the Monday woes this morning. I need one more day of the weekend, I swear. It went by way too quickly. Sunday tailgating for the Browns will do that to you. We had a great time with friends, with good food, Bloody Mary bar, and giant Jenga. The home opener is always more exciting with a win for the Browns, but it's not something that Cleveland is used to. So, let's just pretend that "R" and I didn't leave the game early and had to listen to the remarkable last-minute win over the car radio. 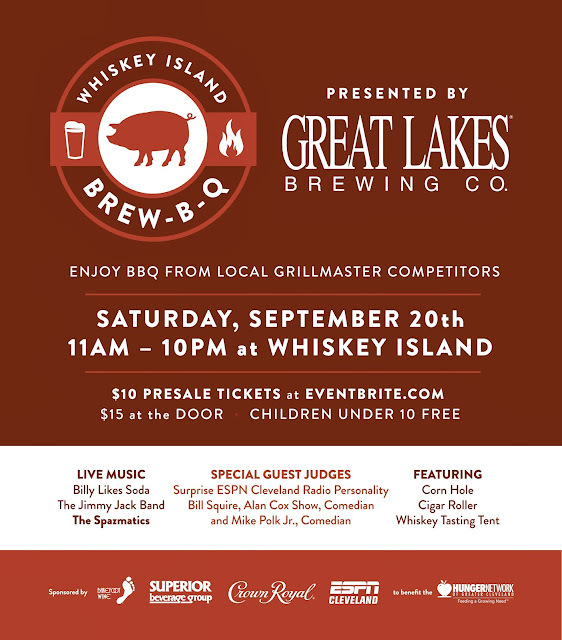 I don't have it in me to tell you about some of our recent dining adventures today, so let's just announce the Whiskey Island Brew-B-Q winner. Congratulations to...Amanda Bates! Please check your email to claim your prize. If you didn't win, you can still purchase tickets to the event here. Come have some fun in the park with brews from Great Lakes, all sorts of BBQ food, corn hole, and a whiskey tasting tent. All for $10 pre-sale, or $15 at the door. 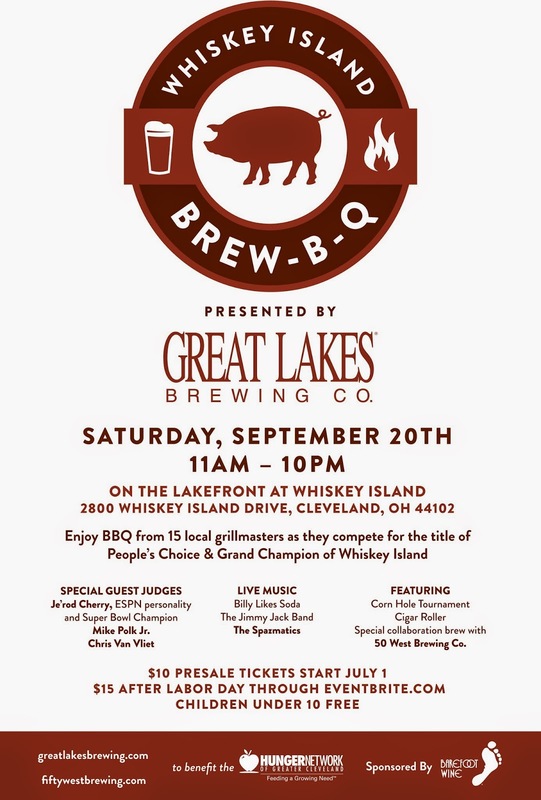 Proceeds benefit The Hunger Network of Greater Cleveland. Disclosure: I was provided with four passes to the event in exchange for blog posts. All opinions are 100% my own. You guys, I have a new toy and I'm totally in love! 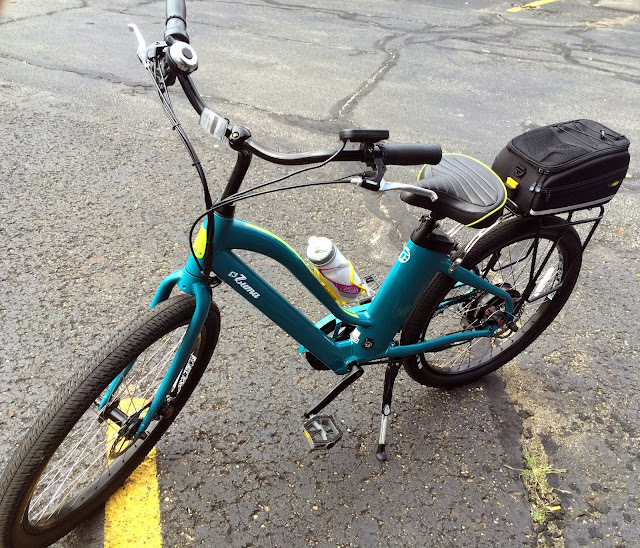 I am the proud owner of an electric bicycle. I can pedal it like a regular bicycle, use pedal-assist in three different gears to give me an extra boost up hills or when "R" is leaving me in the dust, or full throttle mode with no pedaling. It also helps that it's super cute! Which is important, duh. It even led to an impromptu dining adventure last week. We were out for just a ride, and came across Bella Pizza. One thing that I'm loving about the new bike is that we're getting to know our neighborhood much better. Bella's is just a couple of miles from our house, and it's never caught my eye from the car. Boasting "Voted People's Choice" for Best Wings and Pizza on signage outside, we decided that we must try it out. The place is tiny inside, and looks and feels like your typical take-out pizza joint. Nothing fancy. However, they do have a handful of rickety tables for dining in. Just don't plan on eating there on a scorching hot day like we did, because they don't have air conditioning! Or bottled water (they were out). The small pizza that we ordered only took 15 minutes. Excuse the box, they didn't realize we were dining in. Oddly, the toppings didn't seem to be cooked very much. Personally, I would have preferred that they were cooked through a bit more. However, the pizza was piping hot, and the crust was very good. It was that perfect blend of a slightly crispy base to hold up well against the weight of toppings and gooey, greasy cheese, but still plump and doughy. It hit the spot. Since we rode our bikes there, it negates the calories of the pizza. Right? Just kidding. Stay tuned for other Old Brooklyn explorations as we keep riding. I love to try new foods, and new restaurants. However, Chinese is one cuisine that I am not drawn to. I'm often intimidated by the menu (usually very little descriptions, and I'm unfamiliar with classic dishes), and I don't typically spend a lot of time exploring Cleveland's AsiaTown. But, shame on me, because there are a lot of wonderful gems in that area. However, I can always count on my AsiaTown buddy, Michelle, to go on these adventures with me. This time, it brought us to the new Han Chinese Kabob and Grill, after reading Doug Trattner's article in Scene. The restaurant was easy to find on Payne Avenue. There is a small parking lot in front of the restaurant, and the restaurant's sign is pretty large on the front of the building. The restaurant is very clean, modern, and welcoming. You won't find your typical Asian flare decorating the walls and surface areas here. We had done some research on what to order, thanks to social media. We decided to share some smaller items, to get a better taste of their menu. We started with Sliced Pork Belly with Garlic ($5.95). Warning- must.love.garlic! The pork belly was topped with a sizable pile of diced raw garlic, which was very potent. We happen to love garlic, and this dish was one of our favorites. We ordered Spicy Cool Noodle ($5.95). Another favorite, this dish was smothered in spicy chili sauce. We also shared the Stir-fried Noodle Skin ($10.95). Don't be scared by the name, I didn't find any "skin" in the dish. While this was okay, we both agreed that we probably wouldn't order it again. There was an overload of onions, and there was something about the flavor of the sauce that we just didn't care for. Lastly, we couldn't not order a kabob. If you have kabob in your name, then it must be ordered. We decided to share the Lamb Skewer. We had the option of ordering it "spicy" or plain, and we selected spicy. It included six skewers of meat that were still moist when they arrived, but seemed to dry out towards the end of consuming them. They were okay, but I'd honestly probably skip them next time. Overall, it was one of my favorite AsiaTown experiences. The first two dishes were very good, and I'd order them again. Service was attentive and relatively quick, and the meal was very reasonably priced for the amount of food that we received.